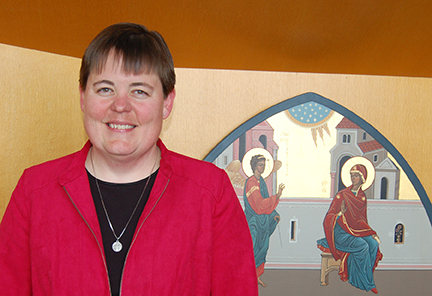 Following a period of prayer and discernment, the Benedictine Sisters of Annunciation Monastery, Bismarck, have elected Sister Nicole Kunze, OSB, as the ninth prioress of Annunciation Monastery. Prioress-elect Sister Nicole succeeds Sister Nancy Miller, who has served eight years as prioress. The new prioress will be formally installed on Friday, May 20, in the presence of the Benedictine community and the Federation president. A public celebration will be held Saturday, May 21, 2016 at 1:00 p.m. in Our Lady of the Annunciation Chapel, Benedictine Center for Servant Leadership. As prioress, Sister Nicole will provide leadership in the Sisters’ sponsored institutions: CHI St. Alexius Health, the University of Mary and Garrison Memorial Hospital. She will serve as president of the board at the University of Mary.